Ancient traditions come to life in a modern setting to celebrate family, food and good fortune. 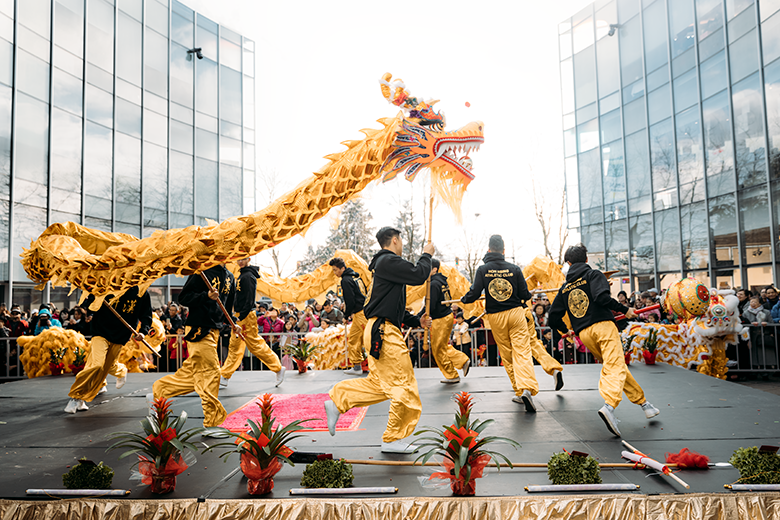 It’s no secret that the Pacific Northwest can get a little gray in these winter months, but just a little ways up the I-5, the Lunar New Year Festival in British Columbia, Canada is a bright and colorful celebration that welcomes the coming of spring in fascinating style. A short 3-hour drive from Seattle, both Vancouver and Richmond, BC have long embraced rich and diverse Asian cultures. And they are never more on display than when families and friends get together to celebrate lunar new year, which takes place on February 5th this year. That day people will ring in the Year of the Pig, heralding luck, wealth, honesty and prosperity with a good dose of humor and understanding. Get revved up for the big day by visiting Aberdeen Centre in Richmond on Lunar New Year’s Eve, where live variety stage shows will encourage singing and dancing to the stroke of midnight. You can also get your fortune told, and test all that promised luck in contests and giveaways galore. New this year to the Lunar New Year Festival is the Coastal Lunar Lanterns installation. Beginning January 30th, a beautiful union of indigenous and immigrant cultures will be on display in Vancouver’s harbour as artists from Coast Salish Nations in BC and the Zihing tribe in Taiwan hang their larger-than-life lanterns against a stunning backdrop of ocean and mountains. Lion dances are another important part of Lunar New Year celebrations, and there are plenty of chances to take in this incredible spectacle, which dates back thousands of years. Dancers don elaborate costumes to bring the lion, a symbol of power and wisdom, to boisterous life right before your eyes. Aberdeen Centre and Yaohan Centre each hold their own event on February 5th, complete with firecracker displays, traditional eye-dotting, and a bustling gift fair. You’ll definitely want to stick around for the weekend to catch the much-loved Chinatown Spring Festival Parade on February 10th. Cultural dance troupes, marching bands, martial artists—and more lions— roam their way through the historic heart of downtown Vancouver. For a truly immersive experience, go early and grab a seat near the towering Millennium Gate at the entrance to Chinatown, first built in 1912 and re-imagined into its present golden glory ninety years later. Finally, one of the most enticing aspects of Lunar New Year—and any trip to the Metro Vancouver region—is the incredible culinary scene, much of it born directly out of these strong Asian cultures. In fact, the New York Times recently hailed Richmond as the place for “the best Asian food in North America.” So, if you want to test that theory for yourself, it’s wise to make reservations well in advance as restaurants fill up fast, especially during the Lunar New Year Festival. With all there is to see and do during the Lunar New Year Festival—events take place from January 23rd to February 17th—you’ll want to carve out at least a few days to explore all the fascinating sights, sounds, and tastes the area has to offer. Luckily, Vancouver and Richmond boast more than 25,000 guest rooms, with accommodations ranging from 4-star hotels to casino resorts and comfortable family-friendly choices. Your lunar new year good fortune may kick in right away as some hotels even offer a discounted stay throughout the run of the festival! For deals like this, and a one-stop guide to all things Lunar New Year Festival, check out lunarfestival.com. Hopefully you will count yourself among the lucky ones who get to experience this special time and place first hand.